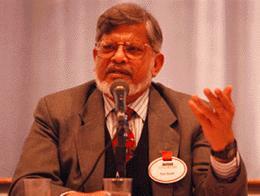 Arun Gandhi, the grandson of Mahatma Gandhi and founder of the M.K. Gandhi Institute for Nonviolence, recalled a childhood in South Africa fraught with anger at the bigotry and discrimination that shaped his everyday life. Dr. Bernard Lafayette, now the president of American Baptist College, remembered three tumultuous years as a youngster in North Philadelphia where he became "the war counselor" or, as he put it, "the guy who would fight anyone." Their lives could have easily deteriorated into further violence, drugs and, ultimately, an early death. But through their own spirituality and the nonviolent teachings of both Mahatma Gandhi and Dr. Martin Luther King, each learned a way to channel their anger into action and their hate into love. "Anger is a beautiful thing. It's a wonderful tool, and it's just like electricity," Gandhi explained. "It is beautiful and powerful if we use it properly and channel it correctly." For Dr. Lafayette, that meant "learning more about love" when confronting bigotry in the South. As a former head of the Student Nonviolent Coordinating Committee in Atlanta in the 1960s, Dr. Lafayette organized and participated in nonviolent sit-ins and peace marches throughout the South, enduring beatings, racial slurs, life threats and church burnings. "I had to turn the other cheek," Lafayette explained, noting the challenge of nonviolence resides in the question, "Could you love someone who spat in your face? "It's one thing not to retaliate. It's another thing to love someone who will hurt you, insult you and humiliate you. Can you respect yourself for being compassionate?" For Lafayette, that meant finding respect in white men who beat him during peaceful demonstrations and in Klan members who threw rocks through church windows. Nonviolence, he explained, even meant bailing out of jail a white cab driver who had beat him during a sit-in. Arun Gandhi traveled a somewhat different path. As a youngster who raged against his oppressed plight in South Africa, he was sent to India to live with his grandfather, Mahatma Gandhi and learn nonviolence. In that grand sweep of history, he watched his grandfather lead the civil disobedience campaign for Indian liberation from the British. Ever since, Arun Gandhi has dedicated his life to alleviating poverty and caste discrimination in India. For him, nonviolent activism has meant more than forsaking physical violence. "You think you are nonviolent because you are not violent in the sense you do not go and beat up people. But you can be violent because you hold a lot of passive violence toward people," he explained. He pointed to the often passive acceptance of inequity and the wasteful use of resources by privaledged countries. "In this affluent society we get all of these things in bulk and we waste them," he explained. "We are discriminating against the people in the world who do not have such resources." "All of these things are acts of violence and unless we can stop this wasteful behavior we are going to destroy ourselves and the world in the process." In addition to this provocative dialogue in front of an audience of over 150 people in Marshall Auditorium, the pair also participated in a dinner in Founders Great Hall where members of the community shared their own experiences with non-violence and its implications for global transformation. Arranged by Ashok Gangadean, professor of philosophy and chair of the department, the special event was part of "A Season for Nonviolence" - a national campaign commemorating the lives and teachings of Mahatma Gandhi and Martin Luther King. Gangadean, who also heads the Global Dialogue Institute, said the event truly reflected how dialogue can move people from different backgrounds toward unity and action. "Their personal stories moved people deeply. People found them very awakening and transformative," Gangadean explained. "One of the things I learned from that day about the process of deep dialogue is the power of telling personal stories." The event was covered in an article by Philadelphia Inquirer Correspondent Christian Davenport that recounted Lafayette and Gandhi's remarkable personal epiphanies on nonviolence.